Bridgeport is Fishing Very Well! 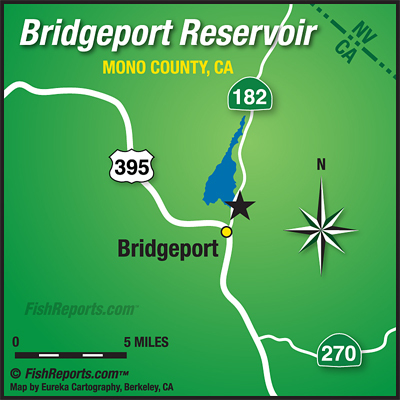 Bridgeport is fishing very well still in spite of the warmer water, it does seem though that a lot of fish have moved out of the channels and over and out to deeper water. There are lots of fish hanging out in the Rainbow Point area as well as out in 15 to 25 feet of water in the middle of the lake. We haven’t heard anything from the area down near the dam or from any shore anglers lately. Powerbait, crawlers, pinched crawlers and mice tails have all been doing well for the bait anglers. We haven’t heard any noise from the fly anglers lately but it might be a matter of doing some deep stillwater nymphing to get into those fish off of Rainbow Point. There has still been a few anglers having success trolling between Rainbow and Paradise Shores with crawlers, Thomas Bouyants and small Rapalas, you’ll need to keep an eye on you gear so it doesn’t get weeded up and if you do this you should be able to bag some good fish. Walker River - East Fork (CA): The Fishing is Fairly Tough! Sceirine Ranch: The Ranch is Still Hanging in There! Hunewill Pond: The Fish are Pretty Hot! Twin Lakes (Bridgeport): The Twins are Holding Their Own! Walker River - West Fork (CA): The West is Fishing Pretty Well Lately! Virginia Lakes: 9 Pounder Came in Yesterday! Walker River - West Fork (CA): The West has Shaped up Nicely! Sceirine Ranch: Still Some Nice Fish Being Caught. Hunewill Pond: The Mowing Job was Successful! Bridgeport Reservoir: Bridgeport is Still Kicking out Some Very Nice Fish! Twin Lakes (Bridgeport): Nice Fish from Both the Upper and the Lower! Virginia Lakes: Mornings and Evenings are the Best!